We are a second generation general contractor / builder, with more than 40 years of combined experience. Our team has a tremendous background of success. We know that budget and timeline completion are critical components everyday in our business. We push 24/7 to ensure projects are finished on time and on budget. 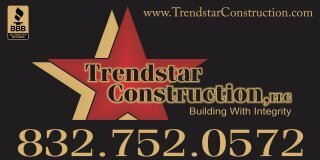 With clients all over the Greater Houston Metropolitan area and surrounding areas, Trendstar Construction LLC has set a standard as a premium provider performing only the highest quality residential and commercial construction. At Trendstar Construction, LLC, our goal is not only to meet your needs, but to exceed your expectations. - To provide unparalleled quality everyday. - To provide aggressive and immediate customer service. - To remember that every work site is someone's home or office. - To treat each client with the utmost respect throughout the entire process.